We at Maxstor, falling into the categorization of highest associations, are occupied with manufacturing and supplying the extent of Tools Trolley. 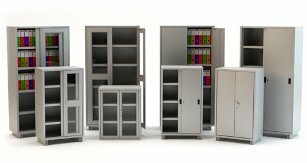 We are leading manufacturer of even other products such as Industrial Trolley, Industrial Tool Trolley, Perfo Tool Trolley, Bin Tool Trolley, Perforated Panel, Steel Pallets, Metal Container, Pipe and Joint System, Drawing Filing Cabinet.These trolleys are accessible in an assortment of statures, sizes, and racks. 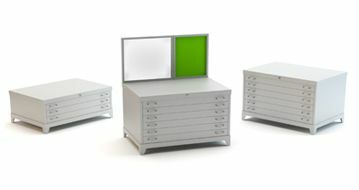 Backed by the rich industrial experience we even fabricate Drawer Tool Kit Box, Trolley, and kits which are widely used in the engineering industry and telecommunication sectors. We made utilizing refined advance; our stock is conveyed at sensible evaluating structures. Our tools trolley supplier are overwhelmingly requested for putting away and moving instruments in distribution centers. 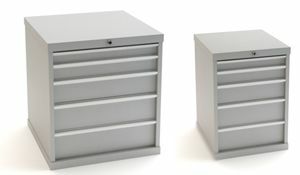 The Drawer Tool Kit boxes, come with a number of partitions, which help in storing tools systematically, with different specifications to suit varied clients requirements. The provided tools trolley featuring vogue in look and can be acquired at greatly apparent rates. The tools trolleys are used by vehicle mechanics and electricians to keep screw drivers, wrenches and other tools in a systematic manner. Our products are fabricated using high end technology and flawless workmanship in our production unit as per the set industry norms of quality. 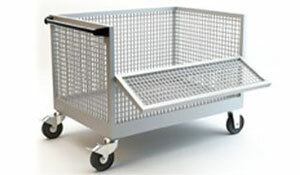 Further, our valuable buyers can available this Tools Trolley at rock bottom prices. 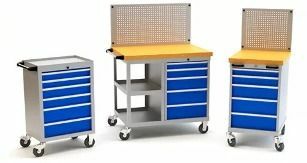 The structure of tools trolley is reinforced by double wall frame with single piece casting which enables high strength and long life, with high-quality ball bearing slides which enable smooth drawer opening. The superior powder coating on the cabinets gives extra rust protection and good looks. The castors in the tools trolley are smooth, strong and chemical resistant and have a load capacity of up to 550 lbs. The noticeable features of these products are strong body, perfect handle, friction free movable wheels and wide spaced racks to place the tools comfortably. It is commonly used in the departmental stores, and other mechanical industries. The product is popular for its rust free quality. Magnetic panel is ideal for pinning up blueprints, technical drawers and schedules etc. 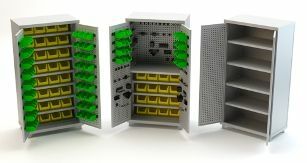 Shelves can be used for easy to access tool and small parts storage. Plastic bin containers are compatible with the shelves and adjustable bin rail. Provides quick identification of tools and a designated place to return tools. Tools are easily accessible, with no need to rummage in drawers or cabinets. Available with adjustable bin rail to accept plastic bin containers for small parts.